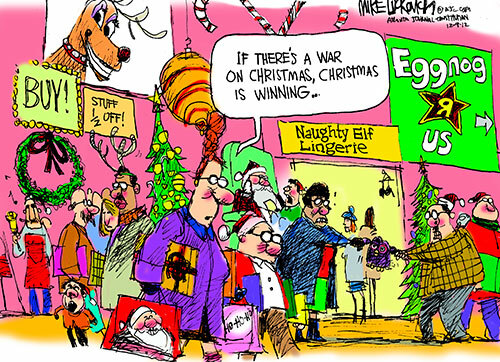 AS IT STANDS: Don't Worry, CHRISTMAS wins 'the War on Christmas' Every Year! Don't Worry, CHRISTMAS wins 'the War on Christmas' Every Year! Do you know where the expression "...the War on Christmas" comes from? The answer is not the Republican Party. The expression "the War on Christmas" has been used in the media to denote Christmas-related controversies. We can thank conservative commentators such as Peter Brimelow and Bill O'Reilly for inserting their paranoia into the holiday since 1996. Brimelow and O'Reilly claimed any specific mention of the term "Christmas" or its religious aspects was being increasingly censored, avoided, or discouraged by a number of advertisers, retailers, government (prominently schools), and other public and secular organizations. "There is no war on Christmas; the idea is absurd at every level. Those who object to being forced to celebrate an other's religion are drowning in Christmas in a sea of Christianity dominating all aspects of social life. An 80 percent majority can claim victim hood only with an extraordinary flight from reality." So, now you know where the term came from. And, why it gets recycled every year on Fox News. As if we weren't already polarized enough in this country, this stupid meme/controversy rolls around annually, like the Grinch trying to spoil Christmas. But it isn't going to happen! Christmas wins every year.